Logitech 4K Pro vs Brio HD Webcam For Mac - Confused? Some prospective buyers pondering the purchase of a Mac compatible 4K webcam might be confused by Logitech listing of what appear to be identical Ultra-HD web camera models. They initially released the Ultra-HD 4K 'Brio' model of webcam a year or so ago, but recently there's been product listings of a similar-looking '4K Pro' webcam model appearing on their website and at online technology sales sites as well. In reality, it's just another instance of Logitech confusing the marketplace with inconsistent branding / naming conventions. In the past they've sold the exact same webcams for Mac and Windows under differing naming schemes.. For example the C910 vs B910 webcams simply had a different model designator: 'C' for 'Consumer' and 'B' for 'Business' users. The actual hardware was identical and both were high-quality Apple compatible webcams with 720p HD resolution and ultra-smooth autofocus and a razor-sharp Ziess optical quality glass lens. In this case it seems they simply dropped the Brio name and rebranded it on their website depending on whether you're on their Business or Consumer product listing pages. Both use the same model #: "PN: 960-001178" So, if you're an Apple computer owner wanting and needing the highest capture resolution currently possible, EITHER camera - regardless of how its branded is one in the same. Shopping for an external USB webcam for your Apple Mac mini desktop computer? With the recent refresh of the Mac mini desktop computer, a new wave of computer buyers may be looking for a MacOS compatible external HD webcam to plug into it's USB ports. Note that in it's latest revision, the mini now offers 4 Type-C Thunderbolt 3 ports (which also support up to 10Gbps USB 3.1 devices) as well as 2 more conventional Type-A USB 3.0 ports running at 5Gbps speeds. If you opt for a high-end premium webcam for your Mac mini - like the Logitech Brio 4K HD webcam - you can leverage the higher bandwidth of the USB-C or USB-A connections for full 4K video capture. Prior to the 4K video revolution, USB 2.0 was sufficient for 1080p and 720p HD resolutions. That said, given the demands of 4K, the average Mac mini web camera buyers will be more than happy with the 1080p image and frame-rates of the top selling Logitech model, the C922 Stream Pro. If your budget is minimal, there's any number of of 2nd-tier 'no-name' knockoff webcams compatible with your Mac mini that may meet your video chat and capture needs for 30 bucks or less. Many of these steal design elements of popular Logitech cameras to look like Logi models, but may not deliver the same image or audio quality. You also won't have access to Logitech's free webcam utility and will need to pay for a 3rd-party app to do any image adjustments. With a next-generation Ultra 4K HD group videoconferencing camera for MacOS, Logitech's new Apple compatible MeetUp webcam really raises the bar for premium voice and video conference solutions at a price small businesses can afford. It offers a very wide-angle 120 degree field of view, multiple beam-forming microphones, and a high-quality speakerphone. An RF remote allows control of motorized PTZ pan and tilt, digital zoom, audio, and call management. These functions can also be done on an iOS app which replicates the remote's buttons. For Apple users, system specifications for the Logitech Meetup conferencing camera start with Mac OSX 10.10 Yosemite on up through the latest MacOS Sierra. The minimum CPU specs recommend a 2.4GHz or faster CPU on your MacBook or Mac and you need to take that seriously for high resolution conferencing. While the Ultra HD webcam sensor can operate at up to 30FPS at a max resolution of 3840 x 2160 pixels, note your video chat app may not be capable of Ultra HD mode. Just as important, your internet bandwidth matters too, as to whether such high frame rates or resolutions are even possible on the receiving device. Lastly, it should also be noted that a 5Gbps USB 3.0 or 10Gbps 3.1 USB port is needed for 4K resolution. USB 2.0 ports are fast enough for more conventional 1080p or 720p HD webcams, but 4K mode needs USB 3.x speeds. With physical dimensions of 4"H x 16"W x 3"D and weighing in at around 2 pounds, it's oblong design is ideal for mounting beneath a meeting room's large panel LCD TV or display. An optional extension microphone is available to extend the camera's 8 foot range to 14 feet in larger meeting rooms.You can learn more detailed specs about the MeetUp cam here. The largely Apple compatible C922 Stream Pro webcam from Logitech is a premium 1080p and 720p HD web camera with H.264 video compression that boasts improved frame-rates over it's predecessor. It replaces the #1-selling Mac compatible C920 webcam which has been on the market for over 4 years. However, note the software bundle of XSplit live streaming and Personify background replacement apps mentioned in it's enhanced features are for Windows PC users ONLY. Though it appears largely similar to the C920, the C922 is a different camera. Visually it features an apparently darker black casing and white LED accent rings around it's face. The internal circuitry has also been enhanced to provide "Up To" 60FPS at 720p and 30FPS at 1080p. Do note that achieving optimal frame-rates is also directly correlated to optimal lighting conditions no matter which webcam you buy, so keep good lighting in mind for any of your video capture or conferencing sessions. Although it is a premium web camera with great clarity, color and light sensitivity - I do note that unlike the C930e, ConferenceCam Connect and other top-end Logitech models, the C922 doesn't brag about having a branded Carl Zeiss optical quality glass lens. The C922 Stream Pro for Mac includes a fully adjustable tabletop tripod with swivel mount that extends to 18.5cm. But do note: Logitech has also been selling a C922X version that does NOT include the tripod. To avoid confusion it helps to think of the 'X' as being crossed-out, without the tripod. Unless you don't need or want the tripod, watch online prices for the webcam very closely: I've seen the model with the free webcam tripod selling for less than the X-model without it. Confused about the differences between the Mac compatible Logitech C910 and B910 models of web cameras? Don't be. Although Logitech has discontinued both, the B910 model still widely available at a reasonable price. So, why the difference between 'B' and 'C'? Electrically, the cameras are completely the same. It's just about Branding, Product ID's and SKU markings. Logitech has a 'Business - B' division for Unified Communications peripherals and a 'Consumer - C' division. In a few instances the same products were labeled and shipped as 'B' models and 'C models' to different markets. Featuring widescreen 16:9 aspect ratio HD video, stereo audio and Carl Zeiss optics, it offers up to 720p HD video calling or capture at up to 30 frames per second. Dual high-quality microphone elements deliver wideband stereo audio capture. The B910/C910 camera has a 78-degree field of view and razor-sharp Carl Zeiss optical glass lens. Logitech's exceptionally smooth and responsive autofocus helps keeps images incredibly sharp and detailed, even when close-up. This UVC-compliant, plug-and-play webcam automatically uses Apple system drivers built-into MacOS Sierra, OSX ElCapitan, Yosemite, Mavericks, Leopard and Lion. With it's exceptional light response, color accuracy and smooth autofocus, most Mac users with adequate room lighting won't really need any image adjustment software. Some prospective Apple compatible webcam buyers are confused about the differences between Logitech's 510 and 525 HD web cameras which look very similar. Both the C510 and C525 are Mac-friendly UVC - USB Video Class device compliant web cameras from Logitech. That means they'll 'Just Work' on Mac OS X 10.4 and higher - all the way through MacOS Sierra using Apple's low-level webcam drivers built into the operating system. The C510 and C525 are virtually indistinguishable on the outside. On the C525, only the word 'Autofocus' surrounding the camera's optics and strangely, fewer pinholes for the noise-canceling built-in microphone element: 4 holes on the 525 vs 11 holes on the 510 model. It should be noted both cameras have been discontinued and superceded by Logitech's C615 autofocus webcam model which takes the HD resolution up to full 1080p HD and includes a standard camera thread tripod mounting hole. For cameras that support H.264 video compression, you have to move up to a C920 or C930e model. Both webcams support maximum 720p HD resolution. So the singularly most important thing that sets the two apart is basically the 510 is FIXED focus (which some prefer for use in, say, Stop-Motion animation setups) versus the ultra-smooth AUTOFOCUS of the 525. It should be noted Logitech delivers exceptionally smooth and responsive autofocus, many lesser AF webcams can be noticeably slow and sluggish or very jerky and 'steppy' in response. Both cams have a plastic - though optical quality lens and offer excellent clarity color fidelity. In our testing, both are notably superior in image than the built-in Apple iSight webcam in our MacBook. The built-in microphone with noise-cancellation is of good sound quality too, far better than most cheap import UVC webcams from China. Lastly, both the Logitech C525 and C510 Mac compatible webcams share the same Fold and Go pivoting camera head design like the C615 that makes for easy portability and lens protection from scratches and smudges when folded closed for privacy or travel. Is your business in the market for an external USB video conferencing webcam which is known to be fully compatible with a Mac computer system? The Apple compatible ConferenceCam Connect is a next-generation group video conference camera choice for your preferred OS X web video chat app for personal use, or for professional multi-party conferences using Skype or Microsoft Lync around the country or around the globe. Some of the particularly note-worthy features of a ConferenceCam Connect webcam for Mac include assured compatibility with Mac OSX version 10.6+ or higher. You simply need plug it in. Apple’s OSX includes basic USB Video Class - UVC hardware drivers so that the webcam will be immediately usable by merely connecting it to any available USB 3.0 or 2.0 port on your Mac desktop or notebook computer system. It includes a battery-powered Remote control to manage all aspects of a video conference call: From Pan and Zoom of the webcam, to speaker volume control and mute, to Skype call disconnect (with additional Mac OSX plugin installed). The camera has an internal battery - something new in conference webcams. You can connect it via USB to your MacBook laptop and hold a videoconference over your WiFi network without necessarily needing to be hooked up to AC power. 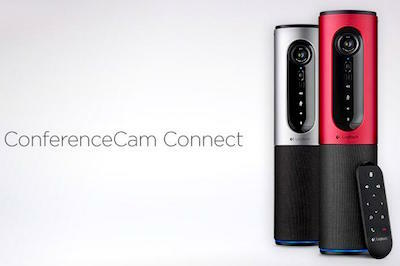 The ConferenceCam Connect webcam additionally features full-duplex speakerphone functionality. The internal noise canceling microphones are of excellent quality which let room participants up to 12 feet away be heard clearly during a voice or video session. A loud and very high-quality internal, down-firing speaker in the cylindrical camera radiates room-filling 360 sound. The ConferenceCam Connect or Mac webcam also supports HDMI video out to a conference room projector or screen if needed. And there's Bluetooth 4.0 NFC support for iPhone or Android phone users to participate in a voice conference as well. The unit also includes an AC wall power adapter, though the camera can be recharged via a MacBook's USB port if need be in a pinch. With a typical listed MRSP price of $499 this business grade webcam is going to be beyond the reach of many - though street pricing is typically $100 or more less. (For more affordable group conferences, the Logitech BCC950 is a lower-cost alternative with many of the same features.) However the compelling features make this an exceptional webcam . Want the absolutely best Mac USB HD webcam money can buy? Have you been shopping for a very high-quality external HD webcam which is known to be tested compatible with your Mac computer system? The Mac compatible Logitech C930e is a great camera choice for experiencing razor-sharp, 720p high-definition Mac online video chat sessions or for capturing pristine 1080p video clips for use with iMovie or for uploading to YouTube and other popular video websites. Some of the particularly special features of the Logitech C930 webcam for Mac include H.264 video compression to insure a smoother Skype HD session, or reduce the file size of video captured to disk. A Carl Zeiss optical-quality glass lens delivers image sharpness that no other competitor can match. Color fidelity and light-sensitivity is really exceptional. For many Mac users, this camera delivers a fantastic image out of the box in a wide variety of lighting settings automatically. The camera also has a WIDE-ANGLE 90 degree field of view, about 10-15 degrees wider than most webcams. This makes it ideal for two-person chats side by side in it's wide 16:9 HD video-frame. It's very fast, smooth and responsive Auto-Focus is exceptionally fluid and responsive. On other cheap Apple compatible webcams you might find the camera's autofocus slow and erratic trying to stay in focus when there's alot of movement. The 930e needs no additional software to deliver a great image in adequate lighting. However, a image adjustment utility for OSX is available on the camera's support page. Assured compatibility with Mac OS X version 10.5+ or greater. All you have to do is plug it in. Apple’s OSX operating system includes low-level UVC - USB Video Class hardware drivers so the webcam will be instantly recognized and ready by just merely connecting it to any available USB 3.0 or 2.03.0 port on the Mac laptop or desktop computer. The Logitech C930 webcam also features stereo internal microphones of exceptional quality that are better than the internal mic in a Mac desktop or laptop computer. For particular Mac desktop systems like the Mac mini or a Macintosh Pro, there is no microphone at all. Therefore, adding a Logitech C930 webcam with it's dual internal microphones also adds the ability to record really high-quality audio as well, using just a single USB connection. The Logitech C930e for Mac webcam mounting clip includes an adjustable clip to attach it to the lid of a MacBook display or atop a desktop computer monitor. An industry standard camera tripod mounting screw hole is incorporated into the 903's camera body which will help assure a stable and steady camera image and hold the precision camera position and angle of your choosing when used with a desktop or floor-standing tripod. With a typical street price just over $100 this extremely high-quality webcam ain't cheap. But it's so vastly superior to any of Apple's built-in iSight cameras, it's worth it for achieving professional results. It's an exceptional webcam that delivers a superlative internet conferencing and video recording experience that's worth every cent to professional and business users who want to project a razor-sharp image. Are you in the market for a low-cost external USB webcam which is known to be tested compatible with a Mac computer setup? The Mac compatible Logitech C270 is a fairly good cheap webcam choice for your favorite Mac OSX online video chat program or for grabbing video clips for use in iMovie segments or for your Vine, FaceBook, or YouTube uploads and other popular video websites. Many users will find it's image sharpness and color fidelity equal to - or better than the iSight camera built into some Mac models. A few particularly note-worthy features of a Logitech HD C270 webcam for Mac include 720p HD resolution with a 2MP sensor, a hassle-free fixed focus lens and a built in mic. There's assured compatibility with Mac OS X version 10.5 or greater. One just needs to plug it in. Apple’s OS X includes basic UVC - USB Video Class hardware drivers so the webcam will be immediately usable by simply plugging it into an available USB 2.0 or faster port on your MacBook notebook or desktop Macintosh computer system. The Logitech C270 HD webcam additionally features a built-in microphone of reasonable sound quality which may be an improvement than an internal microphone in a Mac desktop or laptop computer. For certain Mac desktop computers such as a Mac mini or a Macintosh Pro, there isn’t any microphone. So, using a Logitech C270 webcam with an internal microphone also adds the capability of recording audio too, via just one USB device. The Logitech C270 or Mac webcam mount clip includes an adjustable, folding clip to position it to your MacBook display or your desktop computer monitor. A standard camera tripod mounting screw hole sadly is not incorporated into the camera body. Commonly available at a typical listed price of around $25 USD this budget HD webcam is a very affordable choice for nearly any wallet while still delivering a very usable internet conferencing and video recording experience. However we recommend spending another $5 or so and moving up to the 3MP sensor Logitech C310 as a slightly better option with more image detail. Looking for the BEST budget HD web camera from Logitech? In the market and in the market for an external webcam which is known to be compatible with your Mac computer setup? The Mac compatible Logitech C310 is a great 3MP 720p HD camera choice for your favorite Mac internet video conferencing app or for grabbing video clips for use in iMovie segments or for uploading to Vine, YouTube and other popular video services. One of the particularly notable features of the Logitech C310 webcam for Mac is it's RIGHTLIGHT 2(tm) technology. Logitech's RightLight adapts to low-level lighting better than other cameras if needed. Although Logitech has a few other cheaper webcams that work on OSX, the C310 is the lowest model number we recommend whole-heartedly as the best cheap Logitech camera for Apple users. It's instantly compatible with Mac OSX version 10.4x or greater. One just needs to plug it in. Apple’s OSX includes low-level UVC - USB Video Class hardware drivers so the webcam will be instantly recognized and ready by just merely plugging it into an open USB 2.0 or SuperSpeed3.0 port on your Mac desktop or notebook computer system. The Logitech C310 webcam additionally features a decent sounding built-in microphone of reasonable quality that may even be an improvement than an internal microphone in a Mac desktop or laptop computer. For particular Mac desktop computers such as a Macintosh Pro or Mac mini, there isn’t any microphone. Therefore, adding a Logitech C310 webcam with an internal microphone gives the ability to record audio as well, via just one USB hookup. The Logitech C310 or Mac webcam mount apparatus includes a versatile clip to position it to your MacBook display or desktop monitor. Unfortunately it doesn't have a camera tripod mount hole. For that, look to a Look to C615, C920 or C930e model if tripod use is high on your shopping criteria. With an average street price of about $30 USD this budget Logitech webcam is a highly affordable option for nearly any wallet yet still offering a really exceptional webcam online chat and video recording experience.